Be our guest in warm, modern accommodations that offer deluxe amenities and beautiful views of the city. Our spacious New Brunswick, NJ hotel rooms and suites were designed specifically with today’s traveler in mind. All of our guestrooms feature our signature pillow-top Hyatt Grand Beds®, iHome stereo with iPod® dock, 42" flat screen TV, and select Neutrogena bath products. Enjoy this stylish 456 square foot L-shaped suite featuring a separate parlor with stylish sofa and chairs, dining table for four and a wet bar. 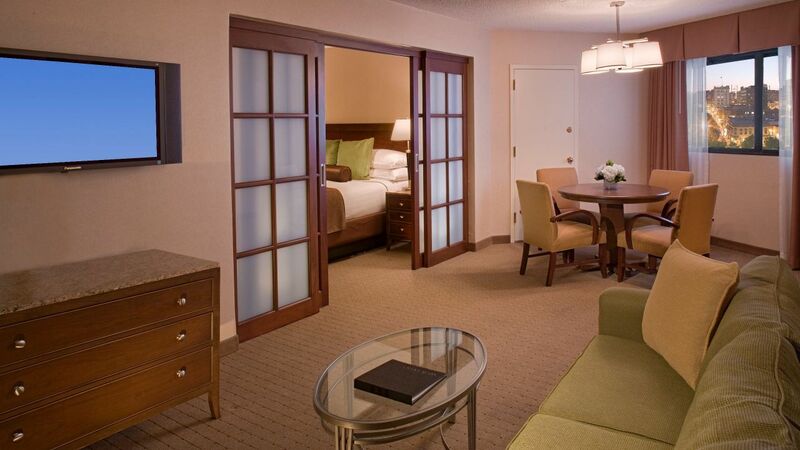 French doors lead to a king-sized Hyatt Grand Bed®, fitted with luxurious linens, a down throw and plush pillows. 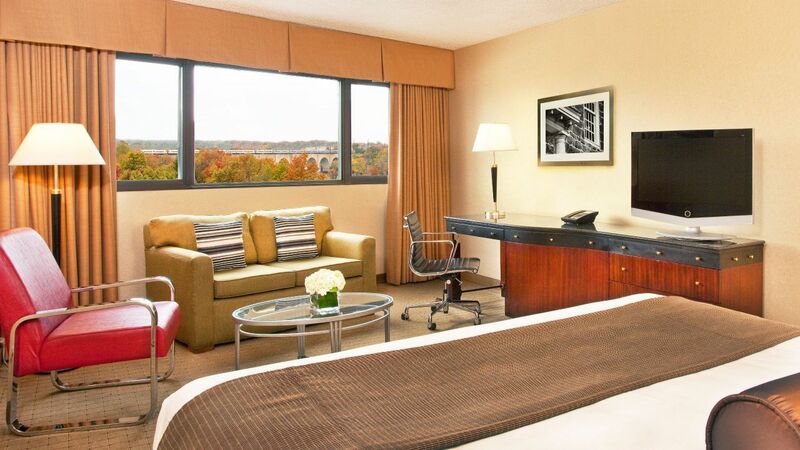 Beautiful city or river views complement pampering amenities, including a generous work area, high-speed wireless Internet access, deluxe Neutrogena bath products and an iHomeTM alarm clock radio. Take advantage of a conference area, dual-line cordless speakerphone with voicemail, dataport, 42-inch flat screen HDTV, cable / satellite HDTV channels, video on demand and video checkout. This is a standard suite. See World of Hyatt program terms for upgrade eligibility. Live the good life in this stylish, 576 square foot, executive-level accommodation. Highlights of this one bedroom suite include a separate parlor with sofa and chairs and a dining table for four. French doors lead to a bedroom offering a king-sized Hyatt Grand Bed®, fitted with luxurious linens, a down throw and plush pillows. Deluxe amenities include a generous work area, coffee maker, deluxe bath and Neutrogena amenities. Take advantage of dual-line cordless speakerphones with voicemail, high-speed wireless Internet access, dataport, video on demand, cable / satellite HDTV channels, a 42-inch flat screen HDTV, iHomeTM alarm clock radio and video checkout. This is a standard suite. See World of Hyatt program terms for upgrade eligibility. Entertain lavishly in this exclusive 648-square-foot accommodation boasting two balconies, separate sitting and conference areas and a wet bar. Located on the 6th floor, this select suite offers the luxury of an in-room refrigerator, iHome alarm clock radio, elegant full bath with Neutrogena products, and high-speed wireless Internet access. An optional connecting 312-square-foot bedroom suite offers one king-sized Hyatt Grand Bed®, fitted with luxurious linens, a down throw and plush pillows. Take advantage of video on demand, cable / satellite HDTV channels, a 42-inch flat screen HDTV, iHomeTM alarm clock radio, dual-line cordless speakerphones with voicemail, video-checkout and much more. This is a premium suite. See World of Hyatt program terms for upgrade eligibility. Surround yourself with luxury in this spacious 1,248-square-foot suite featuring a separate sitting area with plush furnishings, a dining table for six and a wet bar. Two lavish baths offer deluxe Neutrogena bath amenities and plush robes. Relax in the privacy of your stylish bedroom on one king Hyatt Grand Bed™, fitted with the softest linens, a down throw and plush pillows. Unwind in the spacious parlor with a cup of coffee or a nightcap. Additional amenities include a 42-inch flat screen TV, iHome alarm clock radio, a refrigerator, dual-line cordless speakerphones with voicemail, a generous work area, wireless Internet access, and morning newspaper. To make your stay in this elite accommodation more comfortable we include video on demand, cable / satellite channels, video checkout, dataport and more. This is a premium suite. See World of Hyatt program terms for upgrade eligibility. Beautiful views of New Brunswick combine with the warm, modern decor in this stylish 288 square foot accommodation. 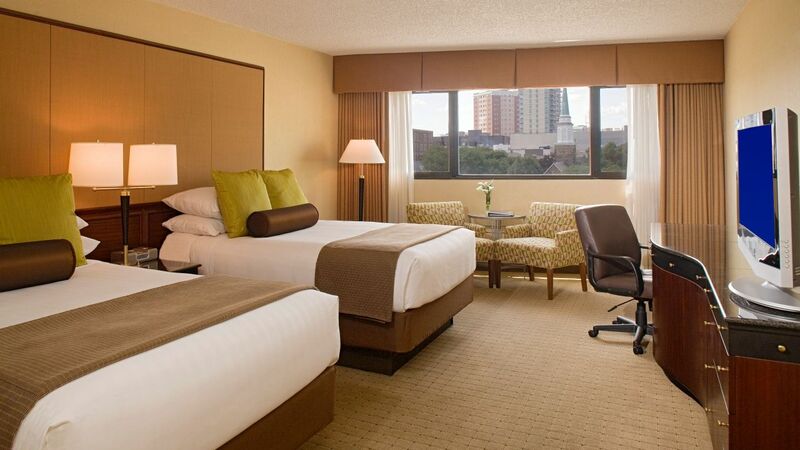 Relax on two double Hyatt Grand Beds®, fitted with luxurious linens, a down throw and plush pillows. Enjoy deluxe amenities including a generous work area, wireless Internet access, dual-line speakerphone with voicemail, deluxe bath with Neutrogena products. Take advantage of cable / satellite HDTV channels and video on demand on the 42-inch flat screen HDTV, a coffee maker, video checkout, a spacious separate sitting area and an iHome TMalarm clock radio. A balcony, refrigerator and connecting room are available upon request. Beautiful views of New Brunswick combine with the warm, modern decor in this stylish 288 square foot room. 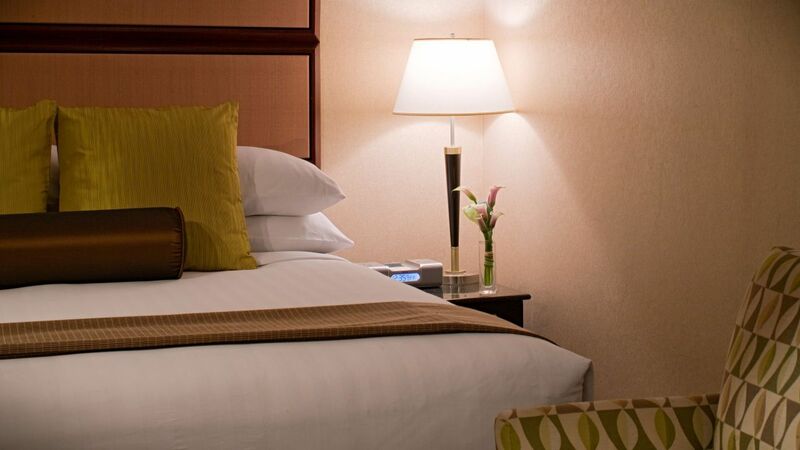 Relax on a king Hyatt Grand Bed®, fitted with luxurious linens, a down throw and plush pillows. Deluxe amenities include a generous work area, wireless Internet access, Neutrogena bath products, dual-line cordless speakerphone with voicemail, and complimentary morning newspaper. Enjoy cable / satellite HDTV channels, a 42-inch flat-screen HDTV, iHomeTM alarm clock radio, dataport, video on demand, video checkout and more. A spacious balcony and connecting room are available upon request. Premier views of the city of New Brunswick are yours when you stay on the exclusive top floors at Hyatt Regency New Brunswick. Relax on a king-sized Hyatt Grand Bed®, fitted with luxurious linens, a down throw and plush pillows. Deluxe amenities include a generous work area, high-speed wireless Internet access, Neutrogena bath products in the deluxe bath and a dual-line cordless speakerphone with voicemail. Enjoy cable / satellite HDTV channels, a 42-inch flat-screen HDTV, iHomeTM alarm clock radio, dataport, video on demand, video checkout and more. Premier views of the city of New Brunswick are yours when you stay on the exclusive top floors at Hyatt Regency New Brunswick. Relax on two Double Hyatt Grand Beds®, fitted with luxurious linens, a down throw and plush pillows. Deluxe amenities include a generous work area, high-speed wireless Internet access, Neutrogena bath products in the deluxe bath and a dual-line cordless speakerphone with voicemail. Enjoy cable / satellite HDTV channels, a 42-inch flat-screen HDTV, iHomeTM alarm clock radio, dataport, video on demand, video checkout and more. Stay on the exclusive top floors of our urban New Jersey lodging. Relax on a king-sized Hyatt Grand Beds®, fitted with luxurious linens, a down throw and plush pillows. Deluxe amenities include a generous work area, Wi-Fi Internet access, Neutrogena bath products in the sumptuous bath, dual-line cordless speakerphone with voicemail, and complimentary morning newspaper. Enjoy cable / satellite channels, a 32" flat-screen TV, iHome stereo with iPod® docking station, data port, video on demand, video checkout and more. A spacious balcony and connecting room are available upon request for these comfortable New Brunswick, New Jersey accommodations. Stay on the exclusive top floors of our urban New Jersey lodging. Relax on two double Hyatt Grand Beds®, fitted with luxurious linens, a down throw and plush pillows. Deluxe amenities include a generous work area, Wi-Fi Internet access, Neutrogena bath products in the sumptuous bath, dual-line cordless speakerphone with voicemail, and complimentary morning newspaper. Enjoy cable / satellite channels, a 32" flat-screen TV, iHome stereo with iPod® docking station, data port, video on demand, video checkout and more. A spacious balcony and connecting room are available upon request for these comfortable New Brunswick, New Jersey accommodations. Enjoy the warm, modern decor of this spacious 292-square-foot New Brunswick accommodation. Relax upon two queen Hyatt Grand Beds, fitted with luxurious linens, a down throw and plush pillows - piled atop an irresistible pillow-top mattress. Enjoy deluxe amenities including a generous work area, wireless high-speed Internet access, dual-line speakerphone with voicemail, new deluxe baths with Neutrogena products, and complimentary morning newspaper. Take advantage of cable / satellite channels and video-on-demand on the 32-inch LCD TV, a coffee maker, video checkout, a roomy separate sitting area and an iHome clock radio and iPod dock. Enjoy the residential feel of our contemporary corner accommodation offering more space and sweeping views of the Raritan River. 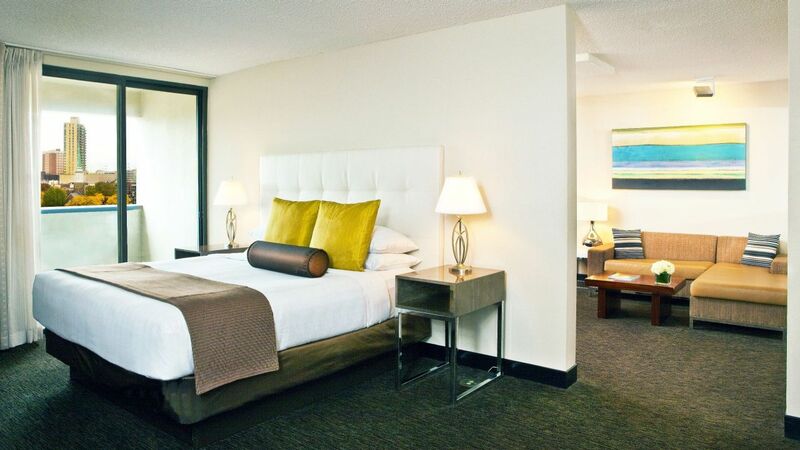 Relax on a king-sized Hyatt Grand Bed®, fitted with luxurious linens, a down throw and plush pillows. Deluxe amenities include a generous work area, mini-refrigerator, high-speed wireless Internet access, Neutrogena bath products and dual-line cordless speakerphone with voicemail. Enjoy cable / satellite HDTV channels, a 42-inch flat-screen HDTV, iHomeTM alarm clock radio, video on demand, video checkout and more. This is a premium room. See World of Hyatt program terms for upgrade eligibility.